Cortisol is a hormone that regulates blood pressure and glucose, or blood sugar, levels. It also helps the body heal from illness and infection. If your adrenal glands don't release adequate amounts of cortisol, all of these important functions can be hindered. Cortisone deficiency, a primary aspect of conditions such as Addison's disease, may cause numerous potentially serious side effects. If you experience symptoms of cortisone deficiency, seek prompt guidance from your doctor. Since cortisol supports blood pressure regularity, cortisol deficiency can lead to changes in your blood pressure or heart rate. According to Alberta Health Services, extremely low levels of cortisol causes a condition known as acute adrenal deficiency, which often results in rapid heart beat, breathing problems and extreme tiredness. In most serious cases, acute adrenal deficiency results in loss of consciousness or coma. 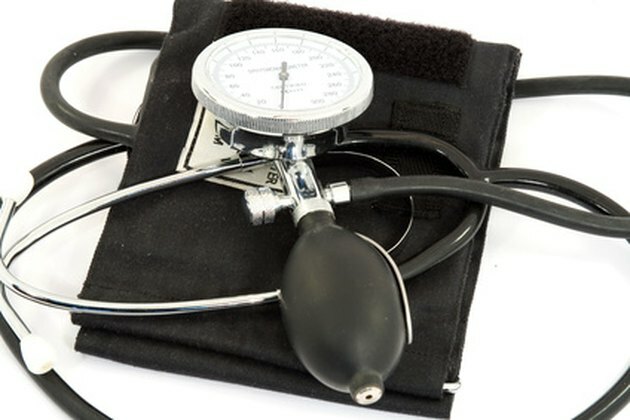 If you experience increased blood pressure, changes in your heart rate or breathing problems, seek emergency medical attention to prevent life-threatening consequences. Chronic diarrhea, or recurrent bouts of frequent, loose stools, can occur as a symptom of cortisol deficiency. According to the University of Maryland Medical Center, people with Addison's disease who experience cortisone deficiency are often treated with medication that effectively restores hormone levels. If you are prone to cortisone deficiency, you may wish to wear a medical alert bracelet, in case a severe episode or reaction should occur unexpectedly. Chronic diarrhea often leads to dehydration. To help remedy or prevent dehydration, make efforts to replenish fluids. Drink plenty of water and/or beverages that contain electrolytes, such as Gatorade. For best results, discuss your diarrhea symptoms with your doctor to determine whether medical examination or treatment is in order. Hypoglycemia, or low blood sugar, is a common symptom of cortisol deficiency. According to research published by the Journal of Pediatric Nursing in February of 2010, children with cortisol deficiency tend to experience low blood sugar levels and benefit from blood sugar monitoring and glucose supplementation when the disorder is active. If you or your child suffers from cortisol deficiency, talk to your doctor about blood sugar monitoring as a means of improving treatment and preventing blood sugar problems. Symptoms of hypoglycemia may include hunger, dizziness, shakiness, anxiety and confusion. Once cortisol levels are properly restored, symptoms such as hypoglycemia tend to dissipate.